See how you can get the most out of your stories with these Mythos features. Great stories start with asking the right questions. With Mythos you can create unlimited, customized surveys to send to each of your beneficiary audiences.Respondents can tell their stories on any device—desktop, tablet, or mobile—and they can upload pictures, video, or audio. 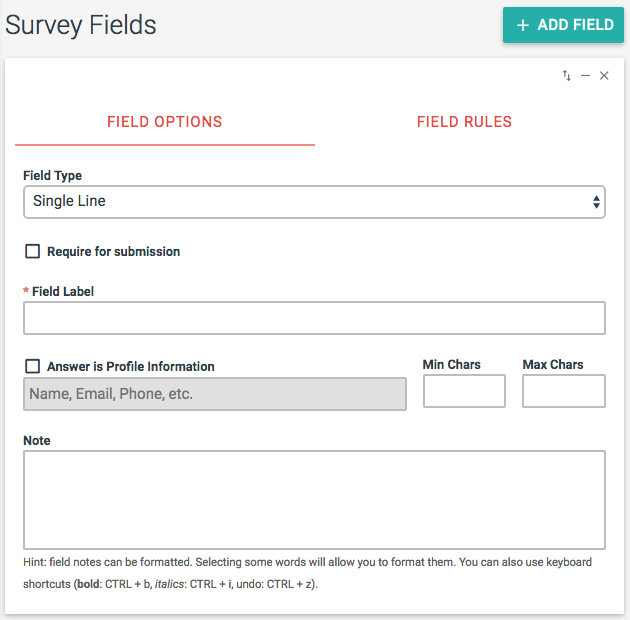 Creating and configuring your survey questions is easy. 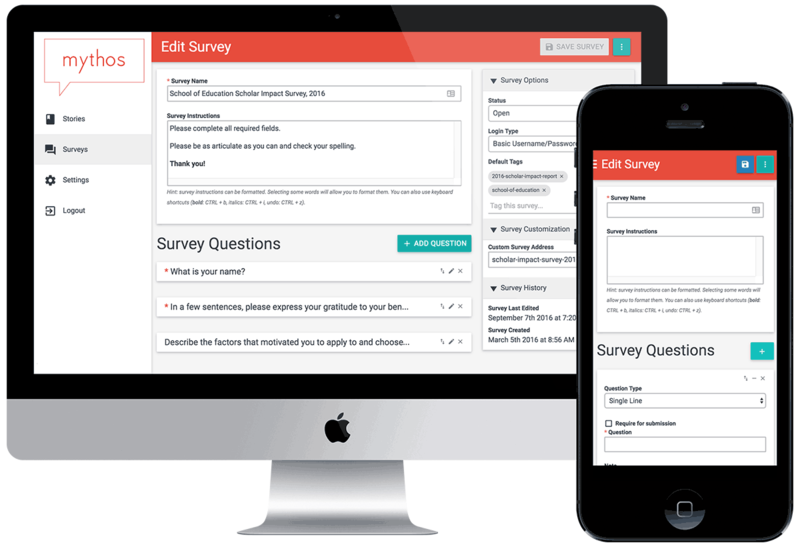 Your surveys can be custom themed so they match your brand and give your respondents more confidence in submitting their responses. Sample “Wellington University” survey theme. Surveys can be custom branded for your organization. Surveys can be open to everyone or set to require a login, which can be useful if you want to only allow certain people to respond or in cases where you want to keep it private. Mythos can also easily connect with third-party authentication systems like Shibboleth for Single Sign-On (SSO). That way your respondents can use the login system they are used to and seamlessly access the survey. Maybe most importantly, you can tag your stories—automatically and manually. Tagging allows you to align your stories to your audiences interests.You can have default tags (e.g., fiscal year or fund type) and dynamic tags based on responses to survey questions (e.g., fund name or state). 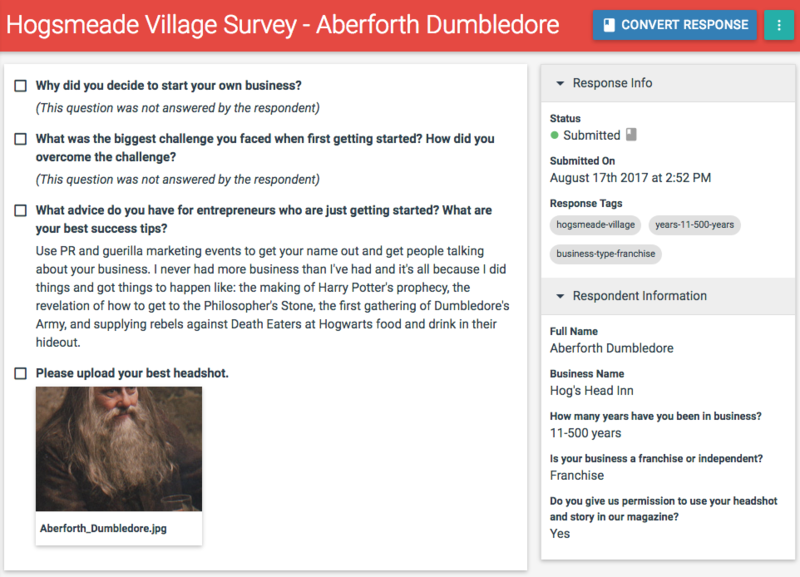 Survey responses come in automatically tagged with keywords so you can easily align relevant stories to the donors that care about them. Private surveys also allow you to preload demographic data you have on your respondents (e.g., name, address, etc.) so that they can update it, if necessary, or you can hide it on the survey so they only have to answer the higher value questions you really want them to focus on. This way each story comes in with the key information about the respondent attached. You can see who’s started to tell their story, who hasn’t, and who’s submitted so you can follow up and get the most stories possible before your deadline. 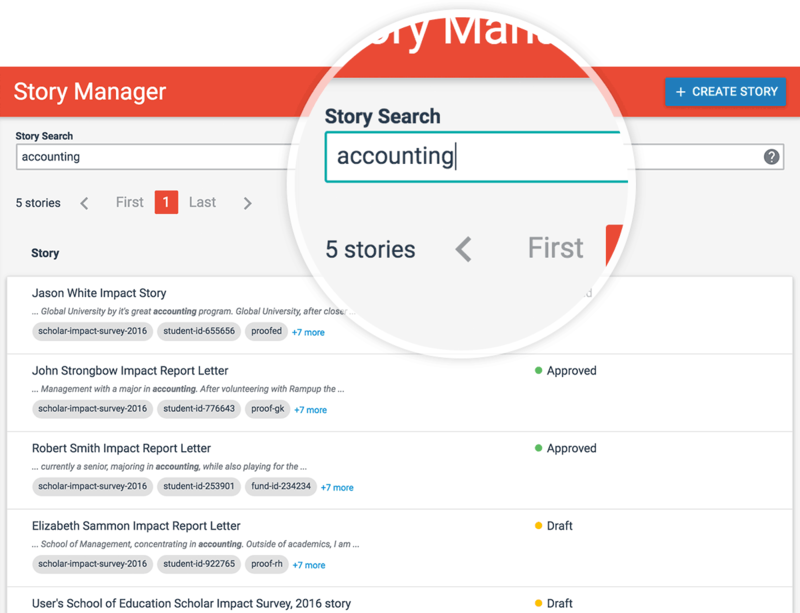 If you’ve already collected stories and just need a better way to manage them, we can help. We’ll import all your existing stories and multimedia. We can also tag all of it so that you can immediately benefit from the power of Mythos tags and workflow tools. Mythos gives you the flexibility to manage the editorial process around whatever workflow works best for you and your team using custom story statuses, advanced search, and tagging.Story statuses can be customized for your workflow and story tags can be used to further customize how you manage the editing and proofing process. As your survey responses come in, you’ll need to decide who reviews them, who edits them, and who approves them. Add custom roles and accounts for your staff so they can contribute to the editorial process. Adding new team members and setting their roles is easy. Use the powerful Mythos search engine to quickly find the stories you need, such as those pending review or those assigned to you.Use Saved Searches to quickly find sets of stories that you access often. Simple keyword search with advanced search and saved searches. Mythos let’s you easily proof and edit with simple, intuitive editing tools. Correct misspellings, embellish the narrative as needed, and add additional relevance tags based on story content to maximize the value of each story. 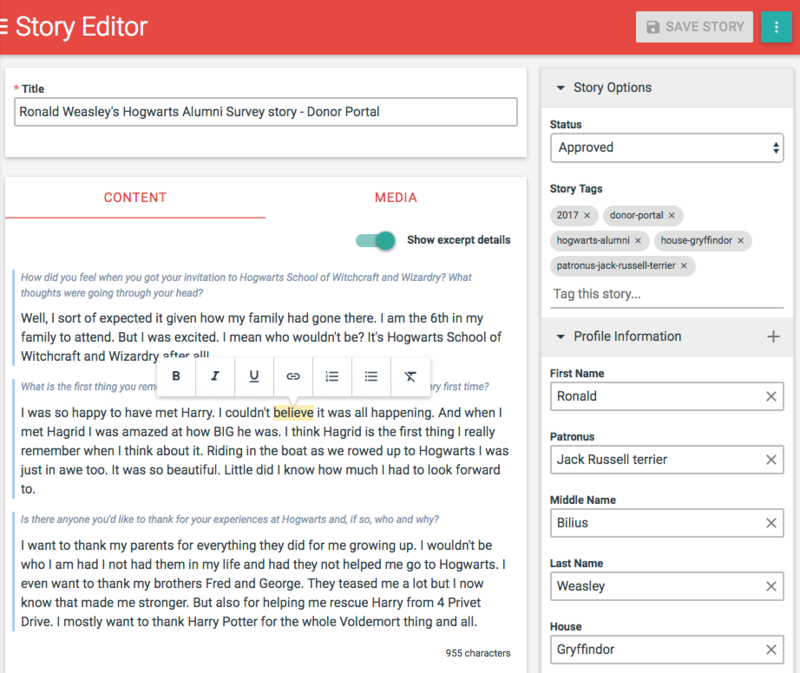 Intuitive and easy-to-use WYSIWYG editing tools make it easy to review, proof, and edit your responses and donor impact stories. Create and save additional versions of each story for specific applications, like long format for a report or short format for the web, email, or a tweet. This is where it all comes together. Using all those relevance tags that have been applied to your stories, you can align the right stories to each of your donors.Have a donor that funded a specific initiative that impacted a beneficiary that went to the same school and played the same sport as that donor? Tell that story to that donor using the school and sports tags on the story. Use our WordPress plugin or our open API to automatically pull stories onto your website based on tags that align with the content of the site or the Campaign topic being viewed. Use our Donor Portal option to give your donors access to their reports and stories online. Export your story content and use it to “merge” content into an email template to not just personalize the email but make it truly relevant to each individual recipient. Donors give to make an impact. They care that you are being a good steward of their money, but they care more about the impact their money is having on the lives of your constituents. Use Mythos to turn financial reports into one-to-one, highly relevant financial AND impact reports. Send regular updates about the progress of beneficiaries or leverage your story content in a fundraising campaigning. Either way, your creating engagement that demonstrates impact and drives increased donations. You’ve collected responses and crafted them into great stories but if they don’t get used, all your effort is wasted.Stories locked in a hidden library don’t do much good. You can securely share access to Mythos with anyone in your organization, such as marketing managers or development officers. Then they can easily search and find the best stories to use to enhance their existing relationships and build new partnerships. But you don’t have to give everyone unlimited access. You can set permissions to control who can see which stories, whether they can edit them, and how they can use them. Plus you can monitor the history of story access and utilization over time. Our creative team can design and create whatever you need and combine it with your Mythos stories and other data–like your fund and financial information–to produce personalized impact reports and marketing materials to make the most of your story collection and crafting efforts.Contact us today.